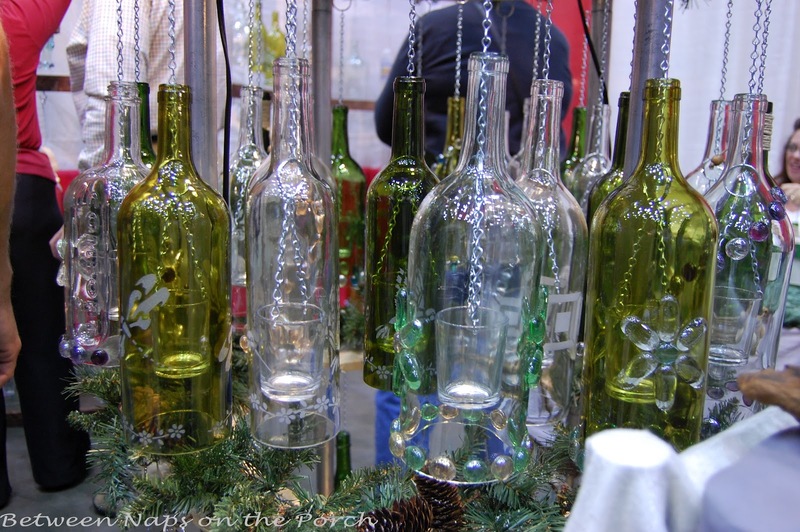 How to Create Your Own Green Retro Wind Chime Out of Recycled Wine Bottles | Homesthetics - Inspiring ideas for your home. 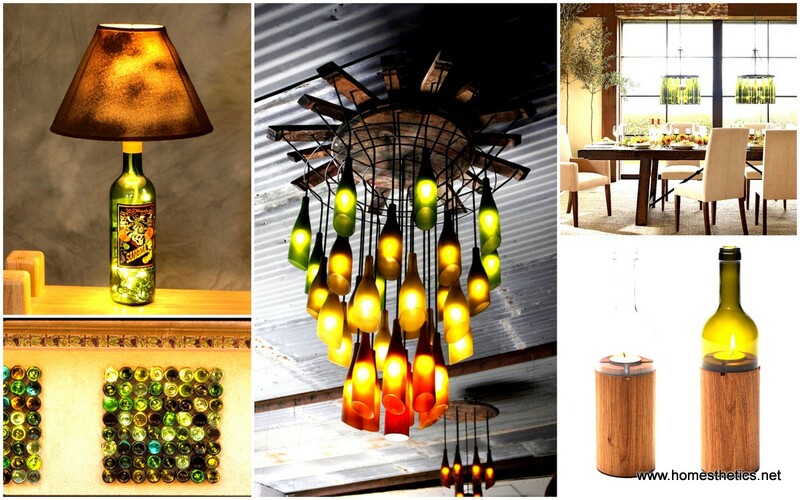 We will continue the sustainable recycle ideas with another wine bottle design idea. 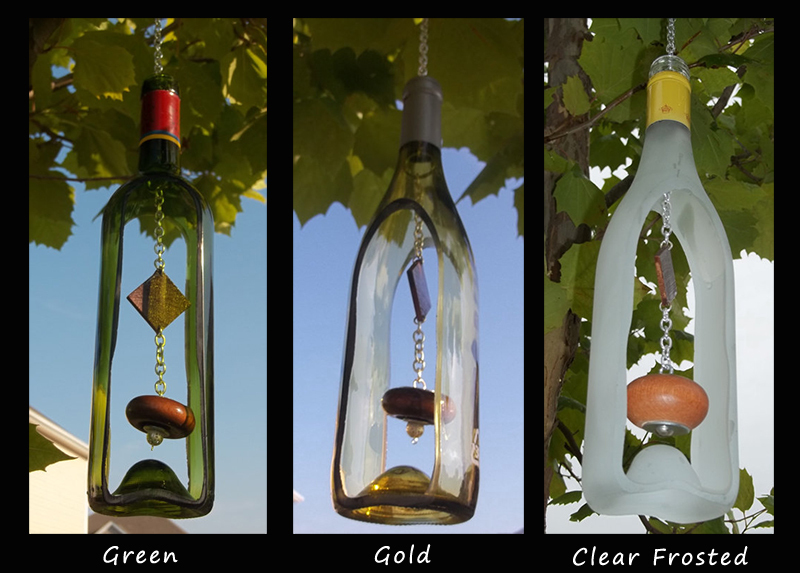 Wine bottles are sculptural objects with amazing resonating properties, making them terrific candidates for a wind chime. 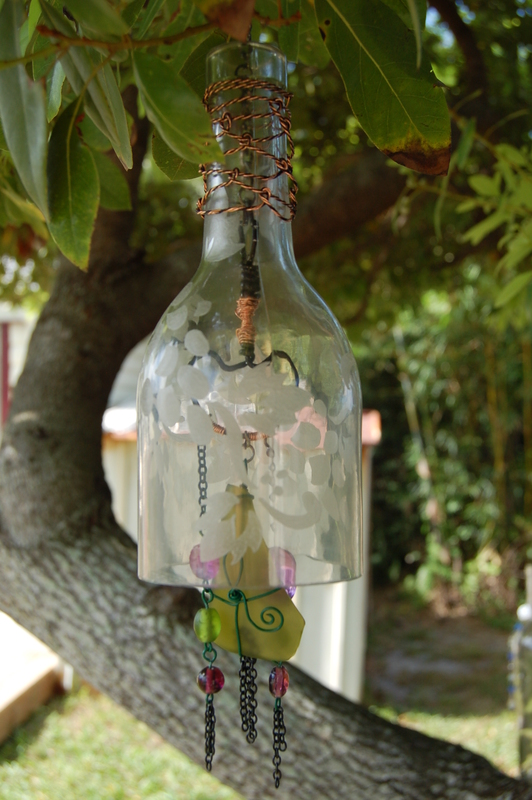 Further on we will present you the materials needed for a green pendant wind chime along with the instruction needed . After those you`ll find more suggestions meant to inspire you, you can use the instructions bellow to realize the others, the explained example being the most difficult in execution. 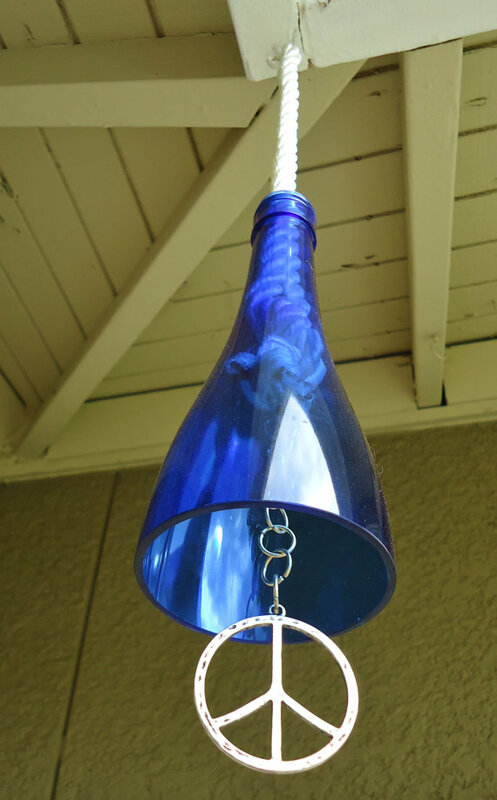 In the pictures, most of the wind chimes are colored, we will describe how to paint them in another tutorial, till then you can use naturally colored glass or simple green orange or white bottles. Prepare the working area by covering it with craft paper or newspaper, this will help you clean faster afterwards and protect the surface of the glass as well as the working surface . Prepare the three bottles in different sizes, small medium and large, these ones will nest inside each other. Measure six inches down from the top of the large bottle, five on the medium bottle and four on the small bottle, mark these distances with a permanent marker afterwards. You can modify these distances to better fit your aesthetic requirements. 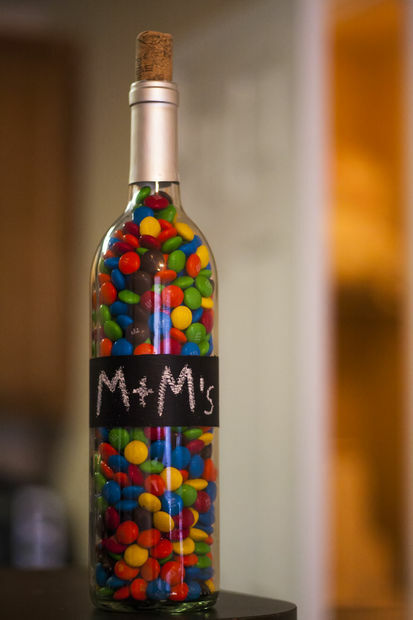 Use the bottle cutter to slowly score and separate each bottle where you have previously marked them. As instructed in the bottle cutter manual, smooth the rough edges as much as you can to prevent unfortunate accidents. Measure and cut 34″ length of the cord, make a know on one end of the cord, large enough to properly hold a 3/4 inch bead. Be careful, not securing the knot here or not making it big enough may cause problems later. Thread one bead onto the cord till it rests against the know previously created, tie another three inch know from the first and thread another bead onto the cord till it stops at second knot. Now thread the cord up, from the bottom of the smallest bottle trough the neck until the bead is comfortable against the opening in the neck of the bottle. Tie another knot and glide on a third bead now. Measure 1 and half inch above the third bead and make yet another knot, add the fourth bead, make another knot, now pull the cord up trough the medium bottle and further up trough the neck. Add a fifth bead next and one more knot, slide the sixth bead onto the cord make one more knot. You are almost done, thread the cord trough the bottom of the large bottle and trough her neck, now knot the cord above the lip of the last bottle and add a one inch bead to the cord and yes, knot again. Measure no less ten 9 inches and make a knot in the cord, now create a loop by inserting a 3/4″ bead onto the cord, inserting the end back into the bead opening to create a loop, now secure the loop with a DOUBLE KNOT to properly hold the bead in place. 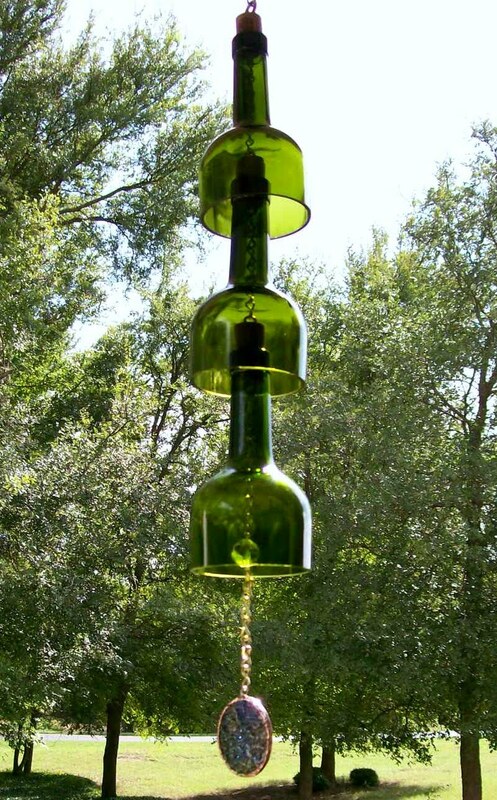 Last and most important step, hang your personalized retro wind chime where a breeze can slowly animate the object and enjoy the relaxing peaceful melody of your wine bottle art piece. All distances may be modified to make a slightly longer or shorter chime, the beads can be of course replaced by something more personal or more relevant for you, we invite you to share with us your own personalized design and to help us by sharing the green sustainable attitude that we are trying to promote. 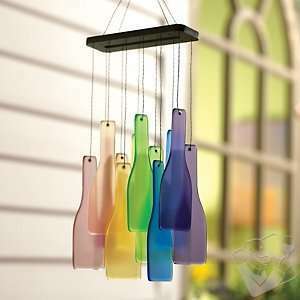 I love the windchimes that have the different color bottles. My friend has one very similar. I would love to make my own. Do you have instructions for that particular one? Did you cut the glass yourself? Thank you!